Ladies and gents, please meet the newest member of the 101 gang…..my brand spanking new bike! I need some ideas of what to call it so please let me know of any suggestions you have? A good bike should have a name! Those of you who have followed my adventure for the past few years will know that in 2014 I took part in a charity bike ride in the states called AngelRide. It was the first and, up to now, the only time I had ever been on a road bike. I fell in love with cycling and Angelride turned out to be the most incredible experience of my life. 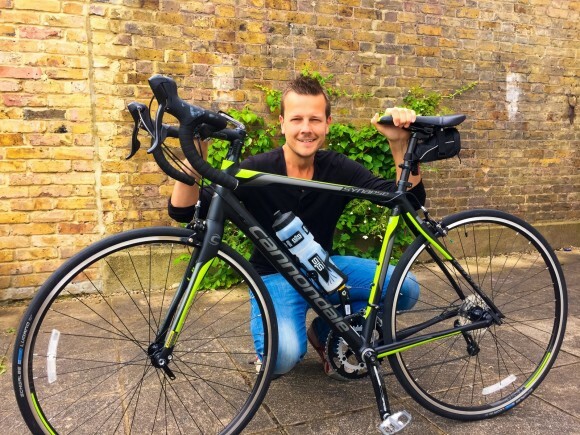 I have sworn ever since that I would get my own bike and also added a couple of cycling challenges to my list, one being to cycle from John O’Groats to Lands End, which I hope to complete next year. The other is to cycle across the USA….date still to be announced for that puppy! 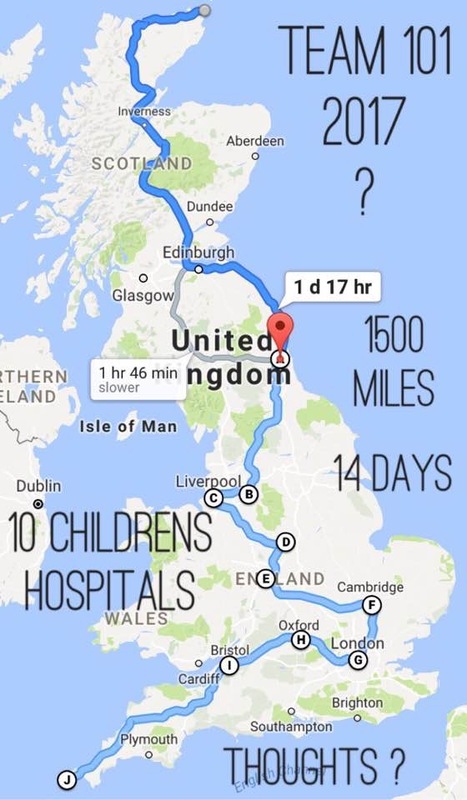 I had hoped to complete John O’Groats to Lands End (the length of Britain) this year but my fitness and motivation took a bit of a knock this so I decided against it until I had adequate time to train for it. Especially when Andy, the team leader for Team 101 in the USA presents me with a map of what he thinks we should do! Yikes! We may have to modify those timings a wee bit Andy……or a lot!;). My haematology doctor may have a fit if she saw that! Anyone who watched my interview on the BBC this week will know there are a couple of little physical issues caused by my life saving treatment as a child that make my idea of normal slightly different to that of others. The main ones are the blood clot I have in the vein that takes blood back to my heart and the others are scarred lungs from radiotherapy and a bit of an aged heart caused by the chemo. The good news is…. 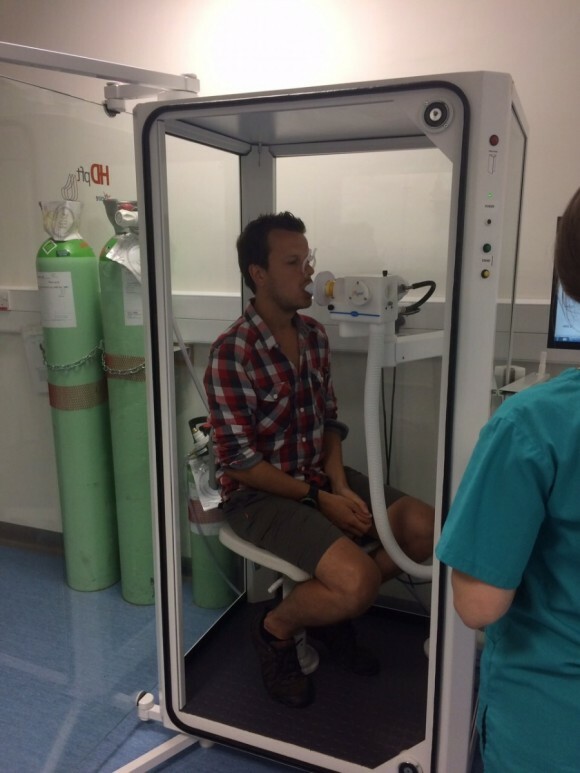 I visited Bristol Royal Infirmary last week and had myself a little MOT to see how the old lung and heart are doing. An Echocardiogram and a lung function test showed that they are a wee bit under the normal scale but that there was nothing to worry about. It also seems that these little issues can be massively be improved upon with regular exercise! I also met my vascular surgeon on Tuesday who pretty much said go for it and then suggested doing a triathlon! Love it! So gang, I am going to be on an adventure of fitness and cycling for the next 9 months which I plan on sharing with you as a bit of a rehabilitation research. This will also include info on nutrition, rest and coping with fatigue…something I struggle with after exercise. Due to my messed up circulation system I struggle to run as blood can’t get back to my heart quick enough so my leg swells up and I get dizzy, but cycling is low impact which means it’s perfect for someone with a deep blood clot like mine. I wont lie -i’m super scared of riding on roads but hopefully I’ll get over this with a bit of practice. So hear goes, I’ll be taking her out and about for the first time this weekend so i’ll let you know how I get on. A huge thank you to Sales Filter, insurancewith and Snow and Rock for becoming sponsors of Team 101. I can’t thank you guys enough. The plan is to achieve something incredible, raise a lot of awareness for all things cancer and mental health related, inspire lots of people and hopefully raise a bit of cash for charity. Let the riding and fitness extravaganza begin!